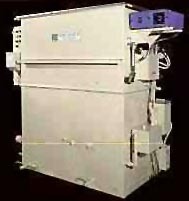 Finishing Equipment IncorporatedLE (Extra Low Emissions) series open-top degreasers are designed for small-batch production cleaning applications. Capable of cleaning machined parts, castings, tubings and other small parts, these degreasers use no water in their cooling operations. The series is available in four models for individual needs. The RA series has two sump degreasers and cleans parts by immersing them completely in a bath and rinsing thoroughly. The degreasers have a self-distilling capability that keeps the second sump clean while oils collect in the first sump. The RU series also features two sump degreasers but with ultrasonics. The RD series is a single-sump degreaser with an offset distillation system for cleaning large parts, while the RB series is a condensate spray model for applications involving vapor condensation and spray cleaning. All of the machines are available with the manufacturer's Super Heat (SRT) system, manual hoist capability, a Powered Rotating Fixture (PRF), electric heat, chip baskets and other options. , 3640 Kennebec Dr., St. Paul, MN 55122. Tel: 612-452-1860. Fax: 612-452-9851.